This week, members of the SoxProspects.com brass have been posting their end-of-season Top 40 rankings and answering some questions about their lists. We'll release our aggregate rankings later today along with the final results of the voting on our site forum. Winding up the series is Editor-in-Chief Mike Andrews, which list also happens to be the site rankings, since he's the Boss the Dude. Why'd you make your pick for Owens/Cecchini no. 3? I’ve gone back and forth over the last month, and ultimately landed on Cecchini above Owens at the end of the season. I’m a little concerned about Owens’ command, and it’s never a slam dunk that pitchers will add velocity, worth noting given Owens' 88-92 mph fastball. I still believe that it is more likely than not that he adds 2-3 mph of sitting velocity, but who knows? Otherwise his development was extremely impressive in 2013, and I certainly won't argue with those who rank him at No. 3. I have high hopes for Cecchini’s hitting ability, athleticism, and makeup. I see him as a .300+ hitter at the big league level, but I have similar concerns about his power as I do about Owens' velocity. His defense also showed improvement this year. If you ask me today, I'll take Cecchini. I reserve the right to change my mind tomorrow. Tell us about one guy not in your top 40 who you think could jump into it next season. The easy answers are any of the DSL players: Dedgar Jimenez, Jose Almonte, Daniel Gonzalez, and Victor Acosta. We’ll get a chance to see them in the spring and at that point they could move into the top 40 before they play their first games in the United States. Since Chris took that answer on Tuesday, I’ll throw a few other names at you: David Chester, Noe Ramirez, and Dioscar Romero. I don’t think that any necessarily profile as major leaguers at this point, but Chester has major league power, Ramirez could end up as a sneaky middle reliever that has a few solid years, and Romero still has a high ceiling despite showing significant control problems this season. Who has made the biggest jump for you since mid-season? Biggest fall? Mookie Betts made the biggest jump. We were really intrigued with his athleticism, speed, advanced approach, and plus defense in spring training, but I personally didn’t expect that type of power or hitting ability to be on display in 2013. And he managed to keep it consistent throughout the year at age advanced levels. He really surprised me, and that full year of consistency makes me think he's not a flash in the pan. Travis Shaw probably made the biggest fall. I had thought he might have the potential to develop into a second-division contributor. Despite showing solid power and plate discipline, he just hasn’t been able to get the bat on the ball enough at the Double-A level. He seems destined to spend another season in Portland in 2014. You were the low man on Blake Swihart. Why'd you rank him at 8? I treat the rankings as if it were a draft, and there are seven players in the system I would have taken ahead of Swihart. It's really that simple to me. I doubt that I’m more down on him than the other members of the Staff, I’m probably just slightly higher on Barnes, Ranaudo, and Webster than them. 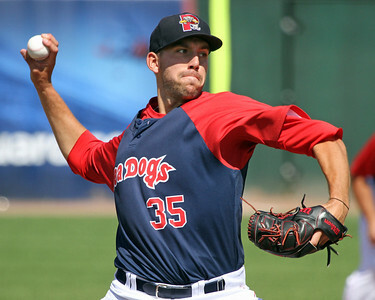 That said, Swihart could very well end up in the top 3-4 at this time next season. I’m still curious to see how many games at catcher his frame will be able to endure each season. You were the highest on Cody Kukuk. Why'd you rank him at 28? Sorry for another Belichickian answer – there are 27 guys in the system I’d take before him in an imaginary draft. I think he has the stuff to develop into a back-end starter or setup man, but he’s also a long-lead player that might never make it past Double-A. I’ll take that type of prospect over a AAAA player most of the time. There are obviously concerns with his control. Issues about his makeup have come up in the past, but he seems to have not had any issues in 2013. We had a big disparity on Myles Smith. Why'd you rank him where you did? 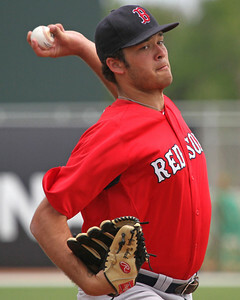 He signed on July 12 and only pitched in five professional games this year, so I didn’t get the chance to see him pitch. To be completely candid, I took the limited third-party scouting reports I have on him and ballparked where I think he should fall in the rankings. You’re basically throwing darts at a dartboard 25 feet away with your good eye closed (I was blessed with one good eye and one not-so-good eye). Once we're able to get eyes on a player, we often find flaws in that third-party data from his time as an amateur and then do some re-ranking. Pick one guy in the list and talk about why you ranked him where you did. I ranked Manuel Margot at number 14. I'd like to think that we were way ahead of the game on Margot after 2012 Instructs, thanks to the hard work of Chris Mellen and Ian Cundall--much like we were with Xander Bogaerts in 2010. It’s not as if Margot had phenomenal success with Lowell in 2013 (.270/.346/.351), but the tools are there for him to develop into an everyday regular and even a top-of-the-order hitter. I’m not going to rehash his scouting report, and he’s still several years away, but he’s a lottery ticket that I’d put money on. Mike Andrews is Executive Editor of SoxProspects.com. Follow him on Twitter @MikeAndrewsSP.